In this remarkable debut fantasy novel by Jordanna Max Brodsky, Greek gods walk the earth. They’ve actually been with us since time immemorial, but with the arrival of science, technology and new forms of faith, their powers have faded throughout the ages so that the ones who still living among us are practically human, barely hanging onto their immortality. As the goddess of the hunt and protector of women and girls, Artemis still embodies a lot of the values she was known for, though these days she has taken the name of Selene DiSilva and has adopted Manhattan as her home. Walking her dog one morning, Selene stumbles upon the corpse of a young woman washed up on the shores of the river. Horribly mutilated and wreathed in laurel, the victim bears all the signs of a ritualistic murder. Recognizing the significance of this, Selene swears to find justice for the woman, and her investigations ultimately lead her to team up Dr. Theo Schultz, a professor of mythology and classical studies. 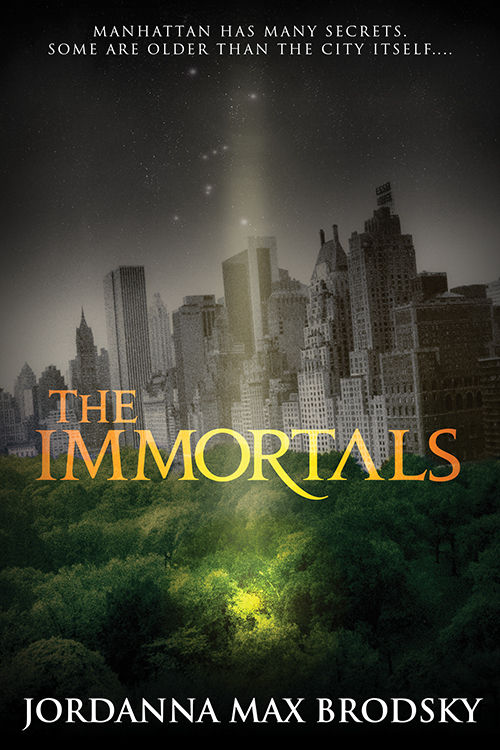 While this might sound strange, one of main reasons I adored The Immortals is the way it bought me back to some of the wonderful books and authors I’ve enjoyed in the past. Essentially, the author has managed to shape something brand new and unique out of a hodgepodge of familiar themes and ideas, and I was amazed at how well the end result worked for me. For example, like many of my favorite books by Juliet Marillier, we have a powerful feminist icon as a protagonist, one who champions women through her words and actions. Selene reminds me very much of Blackthorn from Dreamer’s Pool in that both characters start off very suspicious of everyone around them, but she gradually comes to accept that there are good, honorable men out there who are deserving of her love and trust. In The Immortals there’s also Theo, a Dan Brown-esque geeky scholar-type hero who uses his esoteric knowledge to solve puzzles and chase a killer across the city, trying to stop the murders before they happen (Angels and Demons, anyone?) Finally, and perhaps inevitably, there are the obvious parallels to Neil Gaiman’s American Gods, what with both books strongly featuring a blend of modern culture and ancient mythology along with the central premise that gods only exist because of belief and veneration. Once that worship wanes, so too will the gods’ strength and immortality. The Immortals mixes these popular tropes freely and generously, but in spite of this, its greatness is diminished not one single bit. In fact, the book feels both familiar and new, and I was able to ease into it effortlessly. It didn’t take much convincing to get me on board with the mystery plot either, which was suspenseful and enticing. Brodsky’s prose feels natural and elegant, infused with a hint of casual humor which made this one a rather light fare even in the face of some darker themes, and as a big fan of Greek mythology, I also enjoyed her fantastic and often very witty portrayals of the gods. In addition, the narrative brings to life a side of Manhattan I’ve never seen before, and in a way the setting becomes a character in its own right. There’s always a place in my heart for stories that teach me new things and/or make me see things from a different angle, and this book definitely fits the bill. I also feel very fortunate that I was able to receive a copy of the audiobook for review. To my surprise, one of the narrators is Jordanna Max Brodsky herself, and she ended up delivering an impressive performance. I’ve not listened to too many author-narrated novels, but I can see them having a certain appeal. Not all authors are able to pull off narrating their own books, but Brodsky is undeniably as talented at voice acting as she is at writing, giving her character Selene the perfect attitude on the page and in audio. Robert Petkoff matched her with an incredible performance of his own while reading the chapters devoted to Theo, infusing his character’s geeky but lovable persona with the necessary charm. I also appreciated the sound effects and other little touches that made this audiobook even more immersive. Bottom line, I loved this novel and I have to say the audio format was also a phenomenal experience all around. I honestly can’t recall the last time I rated both story and performance on an audiobook a full five stars (or if I’ve ever even done so before!) but The Immortals most certainly deserves it! Yesss! So stoked that you love this. I don’t trust many reviews, but I saw this one the other day, and the reviewer 5 starred it. I told myself I’d wait for you guys over here at the Sanctum, because I remember seing it on your STS. I am definitely getting it soon! I hope it works for you too! I enjoyed it a lot – though I saw on goodreads that the reviews are quite mixed! I wasn’t that attracted by the cover but it’s great to see that you had such a great time with the story! You made me curious! I’m right in the middle of this book, and I’m enjoying it so much. The characters are not what I was expecting, and I love being surprised like that. Plus, the blending of old and new is so well done. Hope to finish it soon and get my review up! Yes, if the premise sounds like something you will enjoy, I think you will love this book. And the concept of gods and their dependency on mortal worship and belief is definitely a trope I adore as well! Awesome review, Mogsy! I’m definitely sold on reading this book. It sounds fascinating. 😀 Plus, it’s really neat that the author took part in the audiobook recordings! I think this is the first time I’ve read a fiction writer do that. I know of a few authors who have narrated their own work – Neil Gaiman sometimes narrates sections of his books, and Stephen King is another. More recently Daniel Jose Older! But I gotta say, not every author can pull off voice work! I loved this too *claps and dances*. I loved all the hidden places in Manhattan! The Greek Gods were ace and I thought the way the author brings new meaning to some of the myths was really cool! Plus Selene is such a good character. I just so enjoyed this read that I want to talk to everybody about it! This sounds fantastic. I’m always up for a book with a leading lady who’s a good feminist icon. I’ll have to check it out from the library soon. Thank you so much for the audiobook recommendation. I was going to go ebook with this one, but I will definitely do audio. I’m listening to Catherynne Valente narrate one of her own audiobooks right now, and it definitely seems to add something. I’ve had trouble with author narrators in the past – Neil Gaiman puts me to sleep – but when it works, it really works. I kind of want to squeal like a 12 year old – so excited you gave this one 5 out of 5. I think the premise on this one sounds fantastic and am so relieved to hear it lives up to the promise. I’ll bump it up a few notches on the TBR! I’m glad! Really looking forward to your thoughts when you get a chance to check this one out! So glad you loved this book! I’ve had my eye on it so I’m going to go for it and since the audiobook was so good I’m getting that. Great review!